Buck Ram was the man whose master plan was to place The Platters in the stratosphere. He wasn't around at the beginning, though, so success would have to wait. Ralph Bass was the first Platters manager. Kansas City-born singer Herb Reed was there in 1953, responsible for coming up with the Los Angeles-based group's name; he liked they way radio announcers called the latest records "platters." Cornell Gunter (later enjoying a successful run with hitmakers The Coasters), David Lynch, Gaynel Hodge and Joe Jefferson were with the outfit in its earliest days, but the lineup changed quickly as most of the guys departed for apparent greener pastures with other vocal acts. Within months Reed, Lynch and Hodge were joined by New Jersey native Tony Williams, fated to become one of the most recognizable singers of the decade. Williams had a sister, Bertha, who was also a singer; with The Red Callendar Sextet, she recorded using the professional name Linda Hayes and hit big on the R&B charts in early 1953 with "Yes! I Know (What You're Putting Down)" (an answer song to Willie Mabon's current chart-topper "I Don't Know"). Through Linda's insistence, Bass saw Tony perform at a local amateur competition; impressed, he then introduced him to the other guys. Bass got them in the door at Syd Nathan's Federal Records, where their first single, "Give Thanks," was released as Tony Williams and the Platters. 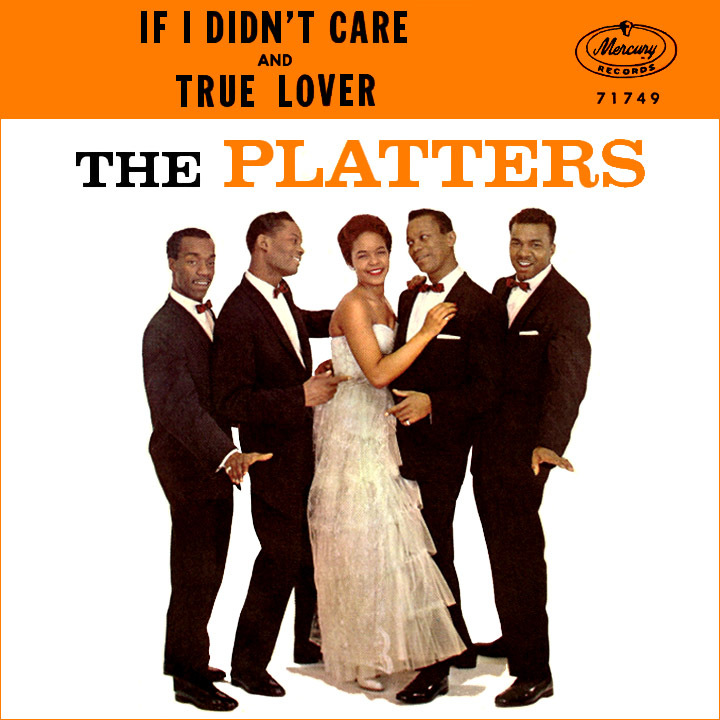 Seven other singles credited to, simply, the Platters, came out on Federal between '53 and '55, none of which made an impact on any charts, local or national. There was one exception, but I'll get to that later. Pop composer and producer Samuel "Buck" Ram replaced Bass as the group's manager shortly after their contract with Federal began. Chicagoan Ram's most notable claim to fame as a songwriter had been "I'll Be Home For Christmas," the 1943 Bing Crosby holiday standard, also credited to songwriters Walter Kent and Kim Gannon. In 1954, Ram came up with the idea to add a female singer to the group to set them apart from other popular R&B vocal acts of the day. Tony's sister Linda Hayes was first choice, but her success as a solo act at the time was reason enough to turn down the offer. Shirley Gunter (Cornell's sister) was considered, but she was part of a girl group, The Queens (who later scored a hit with "Oop Shoop"). A 15-year-old named Zola Taylor auditioned and got the job; everyone involved liked her good looks and her voice. Sometime before 1955 Hodge left and was replaced by Paul Robi; the lineup of Williams, Reed, Lynch, Taylor and Robi remained unchanged for the next five years or so, long enough to make a permanent impression on the music industry. 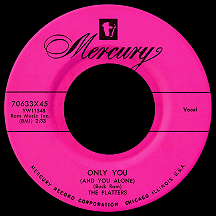 It started with the final Federal single, "Only You (And You Alone)," written by Buck Ram. Right around this time DooTone Records act The Penguins were hot, coming off their pop and R&B smash "Earth Angel," which drew the interest of Mercury Records. Ram began managing them and worked out a deal with the label. His terms? You want the Penguins, you've got to take this other act along with 'em. Mercury execs gave the okay and the Platters suddenly found themselves on the roster of the major record company. "Only You" was rerecorded with R&B and jazz producer Bob Shad and hit the rhythm and blues charts in July, working its way slowly but steadily to number one by October. The single appeared on Mercury's pink label R&B series, but Ram insisted the group had wider potential. The label began promoting the single at mainstream stations while pressing all further copies on its regular black label. In October, just as it reached the R&B summit, the song premiered on the pop charts and within a few weeks had entered the top ten. 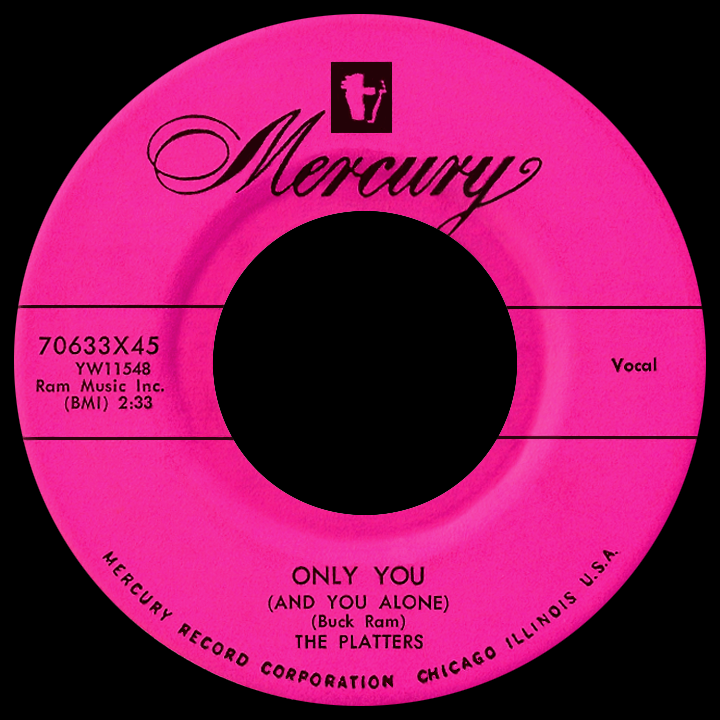 Cover versions being the norm in those days, The Hilltoppers recorded "Only You" and it also reached the top ten, providing a bit of healthy competition for the original. 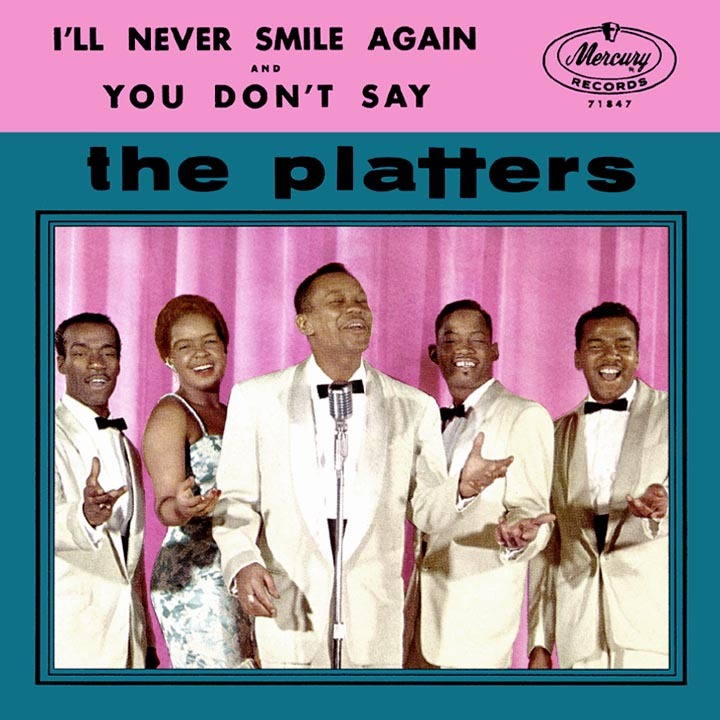 But the Platters had established themselves across the board and were able to capitalize on the momentum of that first hit. 1956 turned out to be a stellar year; "The Great Pretender," another song written by Ram, was Too real! "...it hit number one on the R&B charts at the beginning of January, achieving the ultimate crossover coup the following month when it topped the pop charts. Meanwhile the Penguins, the group Mercury had wanted in the first place, found difficulty gaining traction with radio programmers or record buyers despite solid material; the label dropped them in 1957. 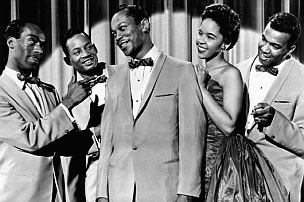 The Platters sang their first two hits in Rock Around the Clock, the 1956 film starring Alan Freed and Bill Haley and his Comets; the appearance seemed to make an impression with rock and roll skeptics, widening the quintet's circle of acceptance with the harder-to-reach older crowd in those days of parents versus teenagers. More performance spots in rock-oriented films followed, including The Girl Can't Help It, also from '56, Carnival Rock and Rock All Night in '57 and Girls Town in 1959. "(You've Got) The Magic Touch" and "Winner Take All" became a two-sided smash in the spring, then Buck took the group in a new, and risky, direction: "My Prayer," a Georges Boulanger-Jimmy Kennedy composition, had been a major hit for both The Ink Spots and Glenn Miller in late 1939. Ram, who'd come into the business during that time, felt it was a good idea to update older songs to the present day, just the kind of thing an "old guy" out of touch with modern times might insist upon. Such a move could have been fatal, but Buck's idea worked well thanks to Williams and his sensationally crisp tenor vocal delivery. During the summer, in the midst of Elvis Presley's onslaught of the airwaves, "My Prayer" reached number one and turned out to be their biggest hit. Originals "Heaven on Earth" and "You'll Never Never Know" and Robert Mellin's "It Isn't Right," all ballads and dynamic ones at that, rounded out the quartet's most successful year...but there were more high points to come. In 1957, the group recorded mostly originals written by Ram or collaborations between Williams and Jean Miles, in addition to other writers of the day. "On My Word of Honor," "I'm Sorry" and "My Dream" continued the pattern of ballads with Tony Williams singing lead. "He's Mine," written by Robi, Miles and Zola Taylor, broke the ballad mold with Zola's sassy lead vocal. All of the group's singles that year were top sellers but none quite made it to the top ten; Mercury released two solo singles by Williams, but those fared much worse, bypassing the charts altogether. Buck took the oldies route for the next single, hoping for results similar to what the group had achieved with "My Prayer." Ram added lyrics to "Twilight Time," which had been an instrumental hit for The Three Suns in 1944; the Platters took it to number one in April '58. A fourth number one came at the beginning of 1959 with "Smoke Gets in Your Eyes," a Jerome Kern-Otto Harbach song dating back a quarter-century to its introduction in the 1933 Broadway musical Roberta. The group's image was well established as squeaky-clean, non-threatening. But in August of '59 negative publicity plagued them for the first time, aligning the group more with the "scandalous" rock and roll artists of the era. While on the road, Paul, Tony, Herb and David were arrested at a Cincinnati hotel for associating with prostitutes. Booked on a morals charge that was later dismissed (it turned out the women were their girlfriends...or were they? ), the incident did some internal damage to the group, as it strained the relationship between the four men and Zola Taylor. Radio stations, at least temporarily, resisted playing their records, though the whole thing seemed to blow over by year's end. They kicked off 1960 with the top ten hit "Harbor Lights," a Hugh Williams-Jimmy Kennedy song dating back as far as 1937 (peaking in popularity when it hit number one for Sammy Kaye's Orchestra, with vocalist Tony Alamo, in 1950). Soon after this, Tony Williams made good on something that had been on his mind since those solo releases in '57: he quit the group, certain that solo stardom of the type that fellow Mercury act Brook Benton was enjoying at the time would be his for the taking. Sonny Turner, a virtually unknown singer, was hired as his replacement and immediately found himself in a frustrating situation. The group's new recordings with Turner were passed over when it came to single releases; Mercury, not wishing to risk the established hitmaking formula, only released older recordings with lead vocals by Williams. Over the next two years, as far as the general public knew, Tony was still at the center of things. Among the group's biggest hits in 1960 and '61 were "To Each His Own" and "If I Didn't Care," both closely connected with the Ink Spots of an earlier era. At the end of the group's contract in 1962, Mercury opted not to resign them. They hung in for a few years without a label deal, working primarily as a touring act. Zola Taylor and Paul Robi left in the mid-'60s (Zola's short-term replacement was Barbara Randolph, who jumped ship after a short time to join the Motown roster) and later started their own separate groups under the Platters name, as did Williams when it became obvious the solo thing wasn't going to happen. Confusion as to who had the right to use the name led to lawsuits resulting in a standoff of sorts; Buck Ram claimed ownership and, in fact, continued to manage the Platters lineup with the most direct link to the original, which still included Herb Reed and David Lynch, along with lead signer Turner, Nate Nelson (previously a member of The Flamingos) and the group's third female fifth wheel, Sandra Dawn. It was this particular combination of Platters that reappeared on the radio waves. Ram got them signed to the Musicor label in 1966. Songwriter and producer Luther Dixon, best known as the guiding force behind Scepter/Wand acts The Shirelles and Chuck Jackson, took over from there. "I Love You 1000 Times," written by Dixon and Inez Foxx, had a contemporary '60s soul sound that put them back in the top 40 (and R&B to ten) in the spring of '66. After six years, Turner had finally scored a hit as the group's lead singer. The following spring, "With This Ring" (written by Dixon, Richard "Popcorn" Wylie and Tony Hester), was the biggest hit for the new Platters. 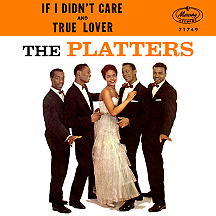 After a couple of years, the Platters name disappeared from the charts for good, but group members continued to perform for decades to come...in many different configurations featuring three, two, one or none of the original singers. These many years later, Sonny Turner is still performing. The five talented personalities who made up the classic group, on the other hand, have all left us, so if you're considering buying tickets to see The Platters in person at any time in the future, be forewarned: you won't be getting the real thing.